A convenient switch that allows you to keep your screen from going dim while taking photos and videos. 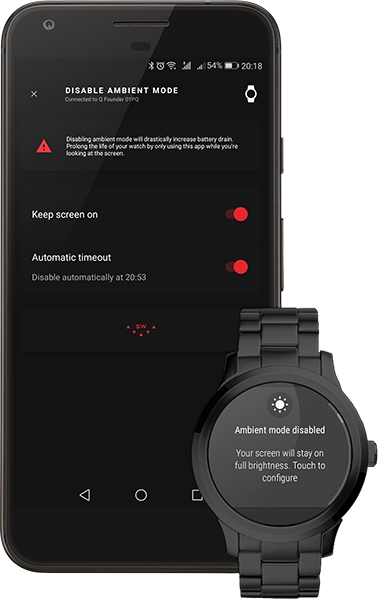 A convenient switch on your smartwatch to prevent your screen from going dim - a feature native to your watch known as 'ambient mode'. With the this app on your watch, you can show off your styles and create a lightshow on your wrist. Control multiple watches from the same smartphone, or simply flip the switch on your watch. Keeps your screen activated on it's current brightness setting. Disable temporarily by covering the face with your palm. Set an automatic timeout of up to 60 minutes from your smartphone companion app. Conveniently start and adjust your settings from your phone. The handheld app supports multiple watches paired with your phone. Switch seamlessley between multiple devices from the handheld companion app. Just like real cola, this app should be used in moderation. Overuse could potentially be damaging to your smart watch display. Be warned that this app will use up a lot of battery power very quickly.